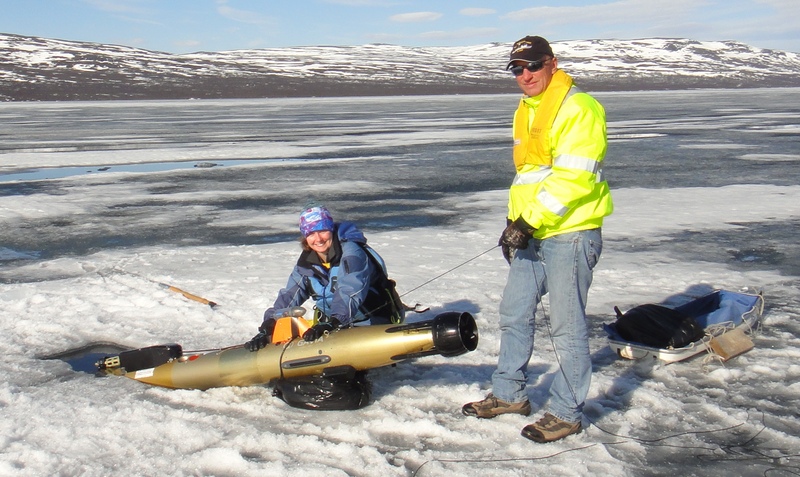 Kelly Graves and Jeff Williams preparing to launch UBC-GAVIA AUV under ice in Lake Kilpisjärvi, Finland, 2013 (Credit K. Graves). In May-June 2013, UBC MASc. student Kelly Graves participated in the CONCUR field study at Lake Kilpisjärvi, Finland to investigate under-ice motion. In May 2014, Kelly will be returning to Lake Kilpisjärvi to participate in the LACUNA study to investigate the currents under-ice.